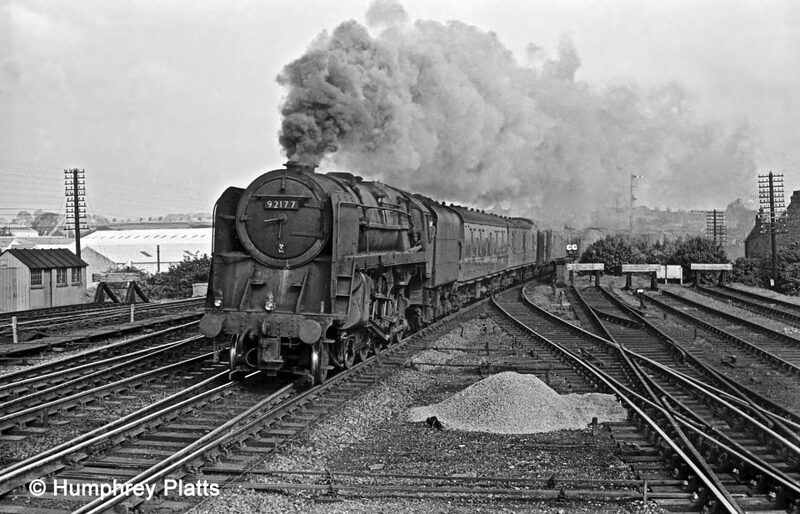 Alan tells us what it was like to run at speed through Grantham on the footplate of a steam locomotive. This was something which Grantham-based crews did less often than men from some other sheds because they would usually begin and end their turns of duty on trains which stopped at Grantham. In 1958 I moved from 41D Canklow shed to Doncaster as a fireman. Redundancies had started to bite at Canklow and I decided that Donny was the shed for me. My dad, Cliff Mitchell, was a driver at Canklow and moved to Donny just before I did. I was on the railway until the end of steam in 1968. My memories of Grantham are quite restricted, simply because we at Doncaster very rarely started or terminated there. I certainly remember being on up trains though, especially fast fitted freights with say a V2 or 9F. I can readily remember bursting out of Peascliffe tunnel and heading for the station soon afterwards. We nearly always 'got the road' with clear signals. It's quite amazing staring through the optics [the small windows at the front of the cab] or hiding behind the 3-inch wide glass near the arm rest and spotting both the home and distant signals thrusting towards the sky. The position of those two red and yellow blades meant speed somehow. They gave more than a clear road but an 'encouragement to keep speed up'. These are the home and distant signals on the approach to Grantham station from the north which Alan regularly spotted from the footplate 'thrusting towards the sky', indicating a clear road through the station and encouragement to make a spirited ascent of the five-mile climb to Stoke Summit. This southbound train on the Up Main line is hauled by A3 locomotive No.60061 Pretty Polly. As the station was now in sight and the train steered left on the curve the driver would be holding the whistle lever and yank it down as the platform became visible. Passengers on the platform took a step back as this great animal of say 30 vans made its impressive presence, not just seen but felt. For both footplatemen on board it was so exhilarating. Naturally we'd have our heads leaning out enough to see the stares of the waiting passengers. A southbound express freight train, probably the afternoon fish train bound for London from Hull, powers through the curve into the station on 25th May 1962 to begin the climb to Stoke, hauled by class B1 locomotive No.61303 of Hull Dairycoates (50B) motive power depot. The driver would be ready to drop the lever down a half turn or more as we hit the south end of the station. More than once I would gesture to my driver to drop the lever a little more as I was quite happy to put those extra shovels of coal into the furnace. Many times Alan Johnson my driver laughed at me as the engine would bark quite loud at his response. Again many times I have heard our guard upon our arrival at Peterborough say, "You knocked off three minutes from Grantham to Stoke." On one of these trips I was with Alan Johnson, a Donny driver who knew his stuff. We had a fitted freight from Donny with a New England (Perteborough) class 9. In my opinion 9Fs were the best 'Standard' locos built. They would do anything, rode well, strong, fast, you name it they could do it. As we approached the station with all signals clear we were batting along at a merry 50 to 60 mph. Needle nudging the red line, water 1 inch from the top and Alan enjoying dropping down the lever getting ready for the incline. A longish whistle as we approached the platform end and myself leaning out of the cab at my side watching the would be passengers see our approach. On Alan’s side the folk on the platform took a step back as this black noisy beast drags its load through with ferocity like it means business. Great to be on the footplate! BR 9F 2-10-0 No. 92177 of Doncaster shed (36A) approaching Grantham station with an up parcels train. The driver views the platforms ahead from the cab window, while the smoky exhaust shows that the fireman has been busy adding coal so as to maintain steam pressure and speed on the five mile ascent to Stoke Summit. 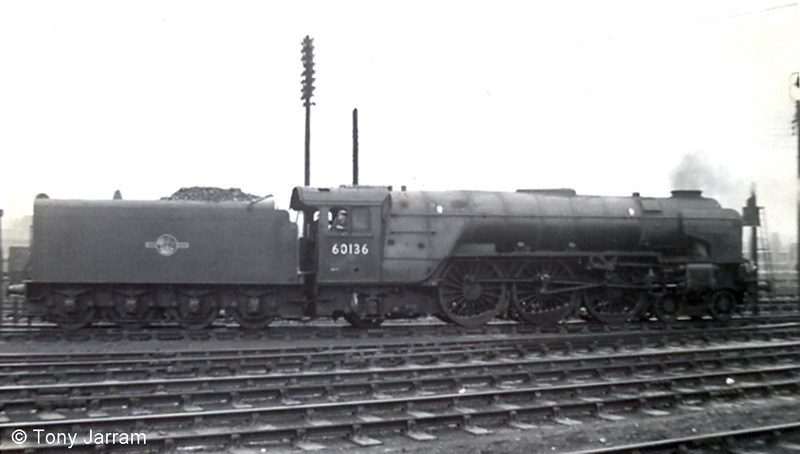 This locomotive was completed at Crewe Works in March 1958 and spent all its short 6-year working life based at Doncaster shed. As we went up the hill, with the distant pegs reaching high into the sky, Alan looked over at the steam gauge and the water gauge and then me. He started to smile when I gestured to him to drop the lever down. This he did and that 9F relished that incline. We went over the top at Stoke like an express. Happy days! 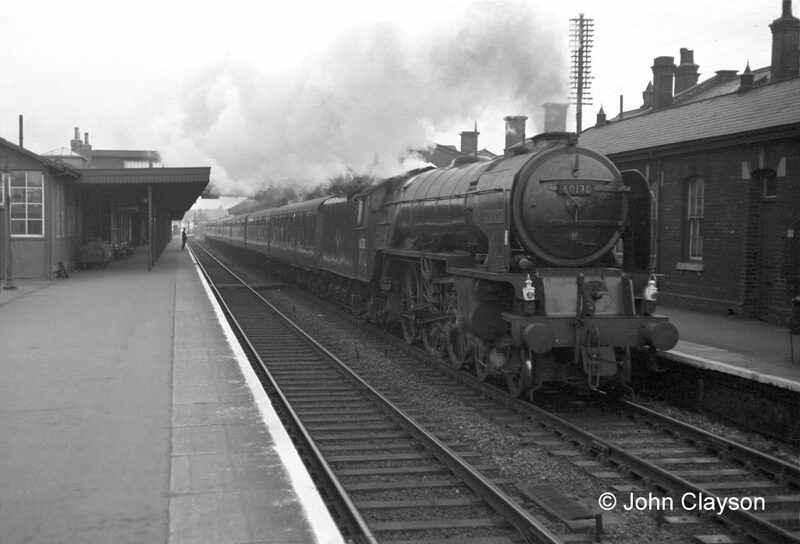 A southbound express passenger train speeds through the station on 25th May 1962, hauled by class A1 locomotive No.60130 Kestrel of Copley Hill shed (56C) in Leeds. This is the point at which Alan's driver would prepare to 'drop the lever', a saying going back to Victorian times when all locomotives had a large vertical lever which worked in a notched quadrant on the driver's side of the cab. The driver would 'drop' the lever down, or forward, by a notch or two to increase power and maintain speed up a gradient. From around the 1900s the lever was replaced by a rotating handle on most locomotives, except those intended for low powered freight and shunting work. This explains why Alan says '...drop the lever down half a turn or more...'. * for further information about this famed exploit see Top Shed by P.N. Townend (2nd edn., 1989, Ian Allan ISBN 0 7110 1827 8) pages 116-117; Steam World Issue 183, September 2002, pages 21-22, and Issue 256, October 2008, pages 22-23. On through down expresses, at the north end of the station as we approached the junction for Nottingham, the line leaned over to the right. The driver would have opened up after the 60 mph limit through the station, and we always got a kick there. If you were not ready you could be on the floor if you had picked up the shovel. It nearly happened to me on A1 No. 60136 Alcazar (what a magical name for a steam loco). It was my first trip on a flyer at Donny. We had taken a parcels from Donny to Peterborough. Our return was train no. 38 down which departed at 2.36am. We hooked on at Peterborough after a King’s Cross loco came off. We were first stop Retford. After we had stormed up Stoke, and I mean STORMED UP as it was timed very tight, we shot through the tunnel. As we were approaching the top of Stoke I knew that my mate Charlie Heaton would shut off steam somewhere at the summit. I let the steam drop to about 220 lbs and made sure both injectors were on just before the tunnel. We shot towards the tunnel and I watched the steam gauge creeping on. I thought “Crikey, I hope she doesn’t blow inside the tunnel.” Fortunately she didn’t, but passing High Dyke Box she blew off. That boiler couldn’t half make steam! Then we were going like the clappers down to Grantham. Charlie braked for the station at 60 mph. I knew that we would have steam on again after the station and picked up the shovel. Charlie shouted, “Hang on a minute and grab the seat!” I didn’t know what he was on about but I did as he said. We hit the junction for Nottingham, where the line also cants. Alcazar leapt about like a bucking stallion and would have caught me had I been shovelling. I was always ready for that kick thereafter. Great Days! Class A1 No. 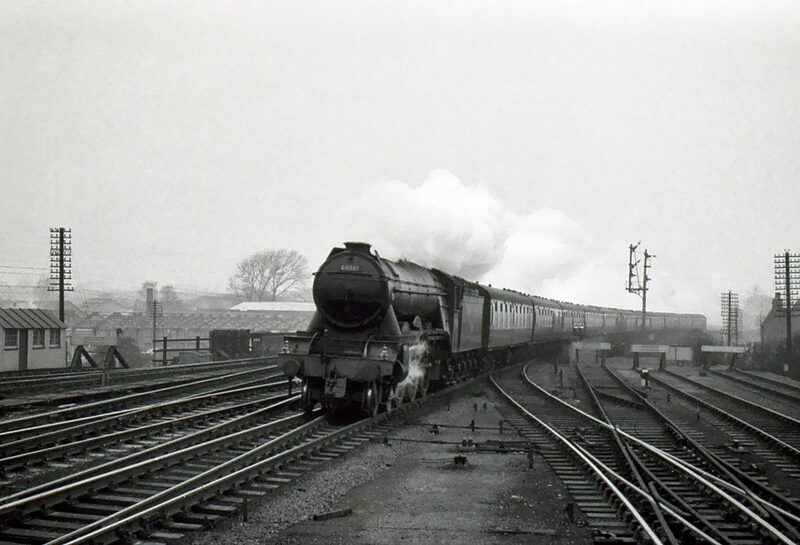 60136 Alcazar reversing towards Grantham shed in 1962. Photograph taken by George Jarram. They really were great days, steam days, though obviously there were times when we had a rough trip. I remember being with driver Pete Hutchinson on No. 60917, a Doncaster (36A) V2. It was the early hours on a fitted freight from Peterborough to Doncaster. We didn’t have a heavy load, but after we were turned out on the main line at Werrington we soon found that 60917 would not make steam. Fortunately, in the early hours, there was not much in the way of expresses to delay so we were kept on the main line. The coal wasn’t brilliant but normally on a V2 they would steam reasonably well. This day it wasn’t so. We struggled up Stoke at a steady pace going hand-to-mouth trying to keep the water level in the boiler at half a glass*. Pete had a look in the firebox and seemed reasonably happy with it. As we went over the top both injectors were on as we disappeared inside the tunnel. The water didn’t come in sight till we were reaching Grantham station. That must have been a close call. HAPPY DAYS. * Note: at Stoke Summit the change in the gradient of the northbound line, from 1 in 178 uphill to 1 in 200 downhill, would tilt up the rear of the 25-foot (7.5m) long boiler of a V2 loco by about 3¼ inches (80mm). This meant that when passing over the summit the indicated water level in the boiler, shown in a vertical glass tube about 6 inches (150mm) long with securing nuts top and bottom, decreased by that amount. So, if you had less than ‘half a glass’ of water in the boiler approaching the summit, the water level would disappear ‘below the bottom nut’ of the gauge glass, meaning that the top (crown) of the firebox was in danger of becoming dry. If this happened the firebox crown would overheat and its fusible plug, a warning/safety device, melted releasing steam into the firebox. This was irreversible, and the loco had to be taken out of traffic immediately for inspection and repairs. The only time that I fired a loco that started at Grantham was with A2 No.60523 Sun Castle, a Doncaster engine. We were parked in the down bay platform and took over from a King's Cross loco and crew. Grantham was a nice little shed with a few grand A3s. There was an interesting way of turning engines. It had a triangle which crossed itself because of the lack of space. I remember turning a pacific on it and was impressed just how it was laid out, with the entry onto it crossing over the exit. On that day we had A2 No. 60520 Owen Tudor and we arrived at Grantham from Doncaster, though I cannot remember what train we had brought in. We went on shed and turned the loco on that triangle. We were then put into a bay platform to wait for our express back to Donny. It was food time. I was not very experienced with pacifics at the time and I had filled the back corners of the firebox with coal whilst we were waiting for our train. My mate Albert (I can’t remember his surname) said not to touch the front with coal, which I left. However, she started to make steam a bit earlier than I thought. Albert was not too impressed, and what he did then astonished me. He picked up the slacker pipe and aimed the water to the front firebars. He doused down the lit embers and squirted all the firebars across the front. Anyway we didn’t blow off. We didn’t have to wait long before the arrival of our train. Off we set. I knew that Albert was a bit rough with the handle, eager to get the train up to line speed. I preferred the Peppercorn A1’s to the smaller wheeled A2 pacifics, but we certainly moved that train. Albert kept me busy but, like all LNER pacifics, she steamed so easily. It just meant that there wasn’t much time for a fag. By the way we kept time and arrived with minutes to spare at Donny.